An analysis of the macro-economic parameters which are affecting the Euro zone and could lead to the Euro's survival or demise. Analyses potential trend reversals offering good trading opportunities. Will China's battle with inflation impact the global recovery? 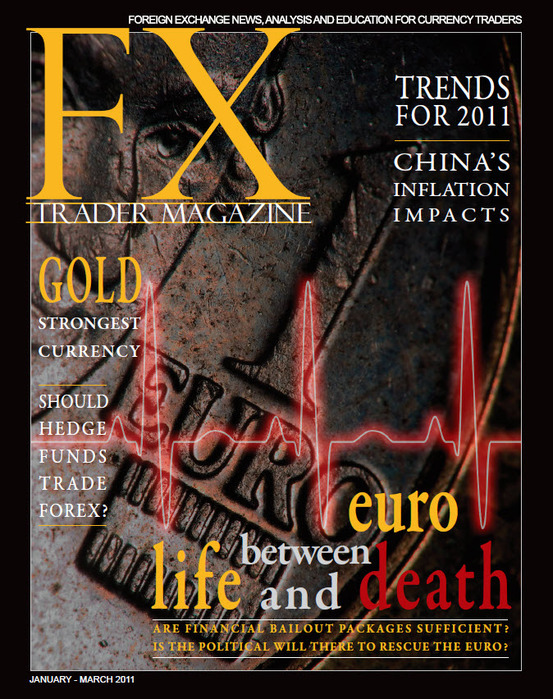 A global analysis of key economical and political events and their forecasted effects on currencies in 2011. Example of momentum strategy dictated by the "Society Says" rule of the market. Retrospect and prospect analysis of the major currencies. SHOULD HEDGE FUNDS TRADE CURRENCIES? Currency trading: The speculator's dream or an acceptable hedge fund strategy? Why gold can be considered as the strongest "money". Interview with Michael Aronovitz, Manager of Gables Capital Management. Interview with Jody Samuels, trader, coach and founder of FX Trader's Edge program. Interview with Karen Jones, head of FICC Technical Analysis at Commerzbank.